While the company is adamant that the Magic Leap One: Creator Edition will ship this year, currently, it seems its CEO is more interested in striking deals with content partners than releasing details about the headset. Meanwhile, in perhaps the most poorly-written SEC filing in history, OLED microdisplay maker eMagin had the tech world convinced that it had persuaded Apple to invest in its technology before clarifying that it meant something completely different. While Magic Leap and Apple prepare to make their entries to the market, Microsoft is looking for new ways to get its HoloLens onto the heads of users in the enterprise world. REALITY BITES: Columbia Ventures has invested $17 million in enterprise AR headset maker RealWear. Both companies are based in Vancouver, Washington. In a report from Bloomberg, eMagin CEO Jeffrey Lucas has contradicted what appeared to be investor information found in SEC filings that surfaced on Monday. Although Apple is listed among several other investors in the company in filing, Lucas told Bloomberg that Apple is not, in fact, an investor in the company. Offering further clarification, Lucas told the news site that eMagin "listed those companies in the filing because it had discussions with them at industry events." REALITY BITES: Drone services company DroneBase has closed a Series B round of funding totaling $12 million to expand its AirCraft augmented reality app. While the consensus among some in the augmented reality community is that the Microsoft HoloLens is the best device available at present, it also remains the most cost-prohibitive option, with the development edition costing $3,000. 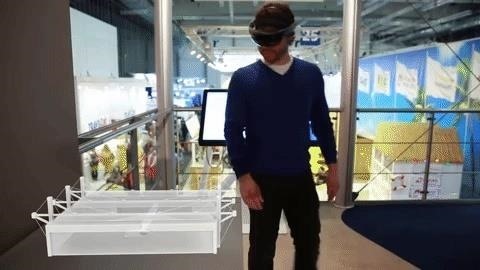 To give customers another option to work with the HoloLens, Microsoft has partnered with Abcomrents, a company that specializes in renting technology for use in trade show exhibitions, to offer the HoloLens for rent.